Roundabouts seem to cause so much confusion to so many people yet their purpose is to improve traffic flow, which if they are used correctly they do so well. In the image above, which car is required to give way to the other under Australian Road Law? I will re-visit this question later. According to Wikipedia, the first roundabout was designed in 1907 by architect John McLaren and built in what is now San Jose, California, although circular intersections were around far earlier, some dating back to the 1700s. Almost invariably across the world now roundabouts function the same, regardless of whether traffic drives on the left or the right (and hence circulates in a clockwise or anti-clockwise direction), in that traffic already in the roundabout has priority over traffic entering the roundabout, although in some places in mainland Europe the old “Priority to the Right” rule applies, meaning traffic entering the roundabout has priority. This rule though does tend to somewhat impede traffic flow. This brings us neatly on to the subject of the question above. How many of you answered that car A needed to give way? Judging from comments on some Facebook posts a great many would have. Part 9 of the Australian Road Rules deals with roundabouts. Rule 114 deals with giving way at a roundabout. The rule is most definitely NOT “give way to the right”; although, obviously, the majority of vehicles that you are required to give way to will be approaching from your right, the subtle difference comes into effect when in a situation as the image shows. Vehicle B has not yet entered the roundabout whereas vehicle A has, regardless of whether vehicle A is moving really slowly and B is moving really rapidly, vehicle B is required by law to give way to A. Of course, defensively speaking it may be prudent for A to stop if driver B is driving like an idiot, but that has nothing to do with the actual roundabout rules. The other, apparently, confusing aspect of roundabouts is that of signalling and lane discipline. Rule 111 deals with lane discipline and rules 112, 113, 117 & 118 deal with signalling. For the purposes of these explanations we will assume a roundabout with 4 entry/exit roads. If you are turning left you must give a left change of direction signal on the approach to a roundabout and approach in the left lane (or to the left side of the road on an unlaned road) unless road markings dictate otherwise. If you are leaving the roundabout halfway around you may use any lane you wish (or any position you are permitted to drive on an unlaned road) unless lane markings dictate otherwise. Rule 110 defines what is meant by halfway around the roundabout. 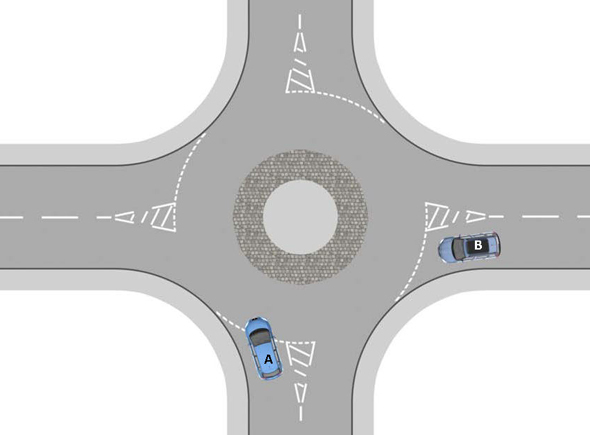 A driver leaves a roundabout halfway around the roundabout if the driver leaves the roundabout on a road that is straight ahead, or substantially straight ahead, from the road on which the driver enters the roundabout. If you are turning right you must give a right change of direction signal on approach and must use the right lane (or left of, parallel to and as close as practicable to the centre line or median strip on an unlaned road) unless lane markings dictate otherwise. For roundabouts that have more than four exits if you are travelling less than half way around (see Rule 110 above) you follow the requirements for turning left, however you only use a left change of direction signal on approach if you are taking the first exit. If you are leaving the roundabout more than half way round then you follow the all the requirements for turning right. (1) If practicable, a driver driving in a roundabout must give a left change of direction signal when leaving the roundabout. (2) The driver must stop giving the change of direction signal as soon as the driver has left the roundabout. (3) This rule does not apply to a driver if the driver’s vehicle is not fitted with direction indicator lights. The penalty in South Australia for failure to comply with Rule 118 (1) or 118 (2) is a $303 expiation notice and 2 demerit points. For the purposes of clarification, if you are driving a car there is NO roundabout in this country, or for that matter anywhere in the world, where it is not practicable to give an exit signal. Not only is it the law it is good manners also. It is permitted to change lanes within a roundabout provided you follow the rules for changing lanes, including giving a change of direction signal. In reality, it is probably not a very sensible idea to do so unless absolutely necessary.